Accounting data is often confidential information. Your QuickBooks data shows how much money you have in the bank, what you owe creditors, and how much (or how little!) profit your firm produces. Because this information is private, your first concern in administering a QuickBooks accounting system is keeping your data confidential. You have two complementary methods for keeping your QuickBooks data confidential. The first method for maintaining confidentiality relies on the security features built into Microsoft Windows. The other method relies on QuickBooks’s security features. You can use the security provided by Microsoft Windows 7 or 8, Windows Vista, or Windows XP to restrict access to a file — either a program file or a data file — to specific users. This means that you can use Windows-level security to say who can and can’t use the QuickBooks program or access the QuickBooks data file. If you’re already employing Windows-level security, you (or someone in your office) know how to use that tool to prevent unauthorized access to (or use of) program files and data files. To use Windows-level security for QuickBooks, you can simply apply your existing general knowledge to the QuickBooks program file or the QuickBooks data file. If you aren’t already using Windows-level security, you don’t need to go to the trouble of learning Windows’s complicated security system. You can use the simpler QuickBooks security. You can protect the confidentiality of your QuickBooks data by assigning a password to a QuickBooks company data file. You can do this during the QuickBooks setup process. You can also set up a password by choosing the Company→Set Up Users and Passwords→Change Your Password command. When you choose this command, QuickBooks displays the Change QuickBooks Password dialog box. To set up a password, you simply enter the same password in both the New Password text box and the Confirm New Password text box. Note that your password is associated with the username Admin (which stands for administrator). Obviously, you want to set your password so that no one (not even a computer) can possibly guess it. This means that your password shouldn’t be a word in a dictionary. Your password also shouldn’t be a number. And your password especially shouldn’t be a word, phrase, or name that some co-worker can easily figure out. The best passwords (from a security point of view) are nonsensical combinations of letters and numbers, such as f34t5s or s3df43x2. After you set your password, you should change it periodically. To change your password, you also choose the Company→Set Up Users and Passwords→Change Your Password command. 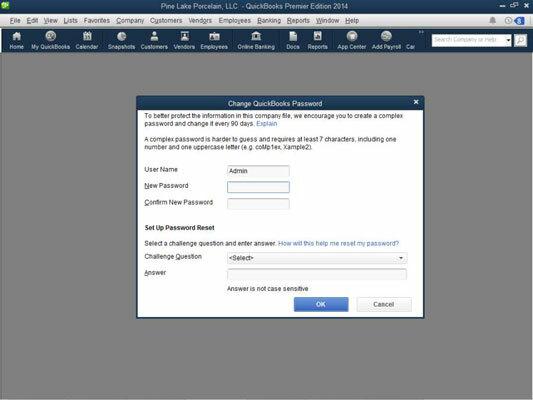 QuickBooks again displays the Change QuickBooks Password dialog box. This time, you must enter your old password in the Change Password text box. Then you need to enter your new password in both the New Password text box and the Confirm New Password text box. QuickBooks requires a username and password before it will open the company data file. For example, if you assign a password to your company data file, whenever QuickBooks starts, it displays the QuickBooks Login dialog box, where you enter your username and password and then click OK. QuickBooks opens the data file. If you can’t supply the password, QuickBooks doesn’t open the data file.